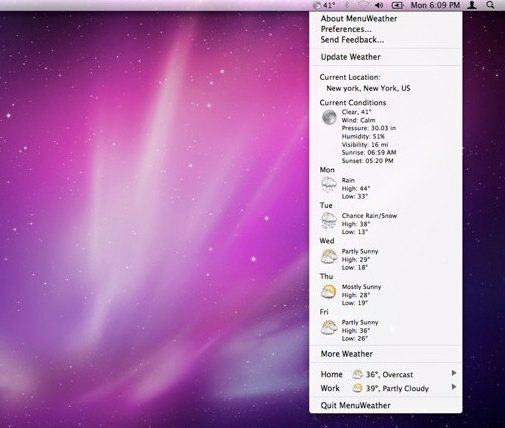 MenuWeather Lite is a great little free app that shows your current locations weather in the Mac OS X menu bar. As you can see in the screenshot, the menu bar item is just a discrete little icon representing conditions along with the current temperature. Within the apps prefs you can add multiple locations to keep track of, adjust temperatures to be shown in imperial or metric, make various display adjustments to the icon set and menu item size, and change how often the app updates. I’ve been on a bit of a menu item kick lately, and this app is definitely a nice addition, although it did crash a few times when I was trying to add some more obscure locations to monitor. MenuWeather Lite uses location services and requires Mac OS X 10.6 or later to install. You can get MenuWeather Lite from the Mac App Store (direct link), it’s a free download. I think its makes the Menu bar a little clunky. I mean a more detailed weather widget already shows up on the dashboard and that’s close enough for me. I am a long time user of WeatherDock (http://www.alwintroost.nl/products/mac/weatherdock) which is also free. Highly recommended. More flexible than MenuWeatherLite. I don’t like the drop down menu, but the little weather icon up top is nice. If the developer reads this, maybe they could enable a feature to only display the weather icon with nothing in the drop down except preferences? Go Apple style, simple is sometimes better. As Jay I recommend WeatherDock too. Personally I like it more.